Before I got to Harper’s Ferry, the first site of a U.S. arsenal (founded at the suggestion of George Washington), the place where they made the rifles and hardware that accompanied Lewis & Clark on their epic journey through across the continent in 1803, I passed quickly through the Antietem battlefield. 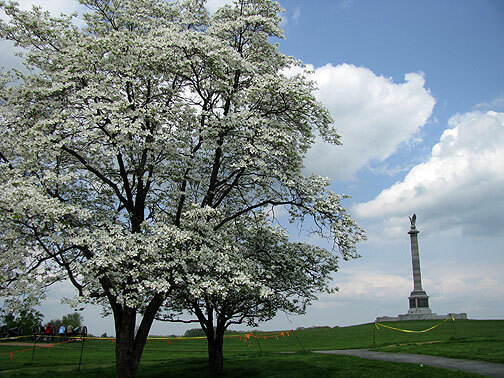 It’s set on grassy rolling hills and is littered with signage put up by the then-aptly named War Department in 1896 as part of an effort to establish an outdoor classroom of war knowledge. I was a big Civil War freak when I was a child, so it still resonates a bit for me, though nowhere near as strongly as it did in my youth. 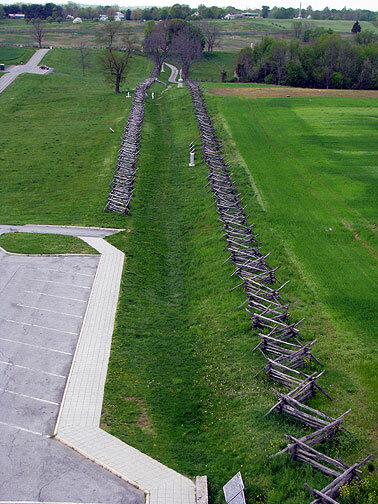 I climbed a stone tower, also built in the 1890s, and took this photo down what was known as “Bloody Lane”… in the three-day battle in September 1862, this stretch was fought over with great intensity, leading to the trench between the two fences being filled with bodies. 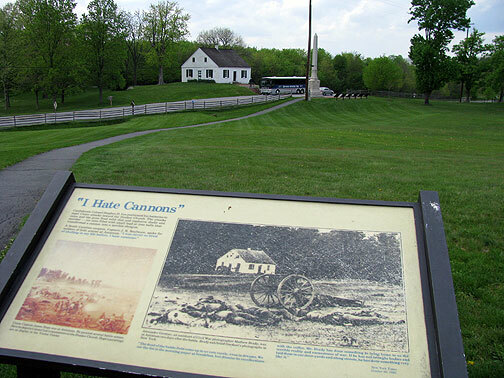 A later exhibit established by the National Park service is called “I Hate Cannons” and quotes a battlefield surgeon who had to handle the thousands of casualties caused by frontal charges into the maws of full firing artillery. It’s all quite bucolic these days, but I can still imagine the screams and horror, perhaps not as vividly as if I had lived through that kind of barbarism, but somehow I can transport myself to the mud and mosquitoes and exhausting, bitter combat that dragged on for three more years after this abortive effort to surge northward by the Confederate Army. 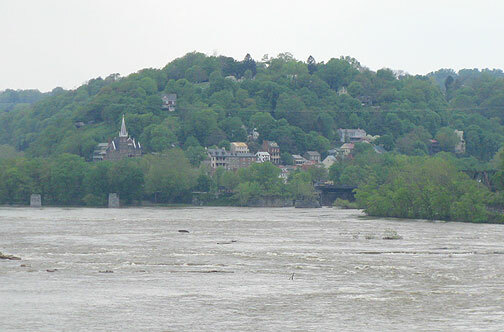 Interesting to visit both Antietem and Harper’s Ferry and finally see the real geography of the areas, and see how close it was to DC, the role of the Chesapeake & Ohio canal, the Potomac River as the key “road” in early times, its confluence with the Shenandoah River and that famous valley, etc. 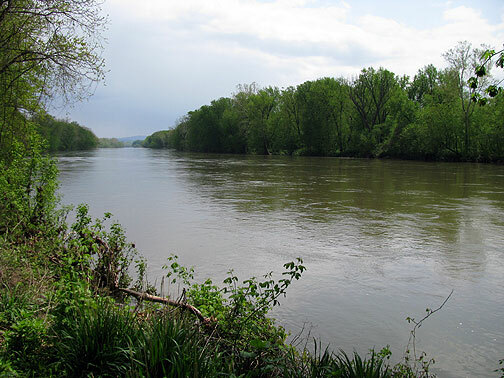 The Potomac River, running quite high due to heavy rains recently. 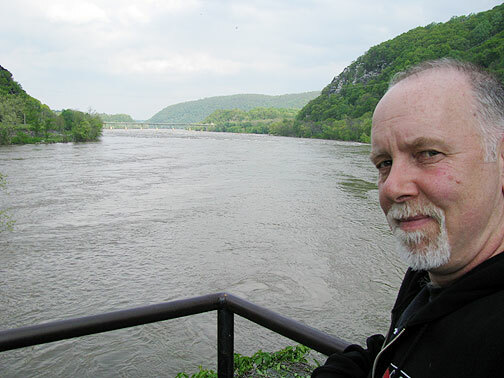 this is me at the tip of Harper’s Ferry, where the two rivers converge. 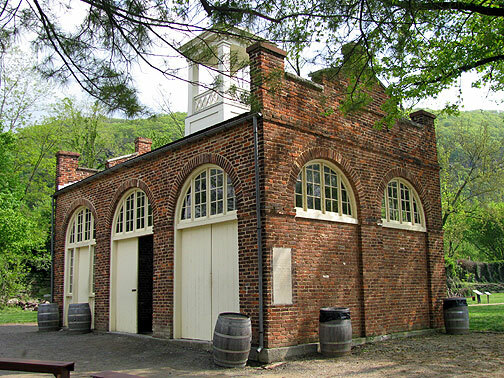 That’s Harper’s Ferry, the historic town, now a national historic park, rather kitschy but also interesting. 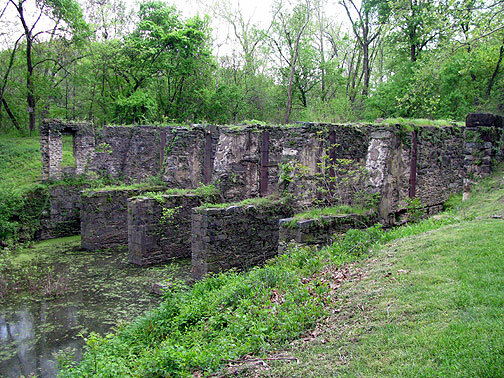 I love ruins like these, of an old pulp mill on the Shenandoah Canal running alongside the River of the same name, just on the outskirts of Harper’s Ferry. 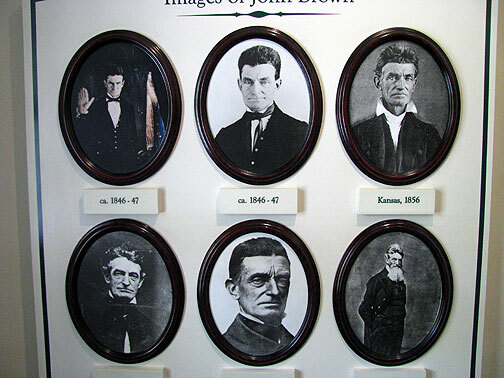 At Harper’s Ferry I had to check out John Brown’s museum, and see the place where he was captured, now restored after being in four other locations in the years between 1859 and now. Here’s his stark portraits. I highly recommend Russell Banks’ book “The Cloudsplitter” for a gripping historical novel approach to Brown’s story. After a nice touristic afternoon I made my way into Frederick, where I had my first official stop of the book tour (the night before, at Penn State, I spoke to the Centre Region Bicycle Coalition, but not really a Nowtopia event)… The friends in this area had hoped to have me at Shepherdstown, W.Virginia, but due to some squabble with neighbors there, they moved it to the Mudd Puddle Coffee Shop in Frederick. 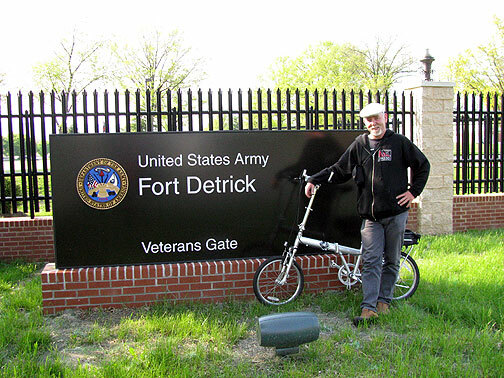 I was met by Gary, a charming young man, who gave me a lovely tour of the town, a city with its own long history, but best known recently for being the home of the latest incarnation of the military-industrial complex: Fort Detrick, home to biowarfare research, and the apparent source of the anthrax spores that helped terrorize the population just after 9/11…. Like so many places around the U.S. the town is gentrifying. 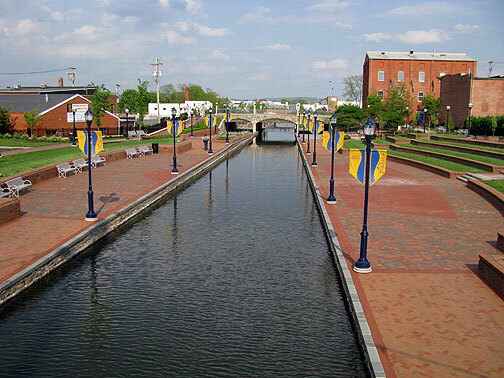 It has been a bedroom community for Washington DC for a good while, and the downtown is fairly prosperous. Gary took me across this little park-like area; the bridge in the background is actually painted and signs direct visitors to the “bridge mural”… probably a better use of the waterway than a lot of other possibilities (culverted underground comes to mind), but clearly also being used as a stimulus for real estate development. The 25+ folks who came to my reading were mostly very young, very impressive, and palpably moving together towards some kinds of radical initiatives. They were planning to contest the I-69 road building plan on the next day. I enjoyed the presentation a lot, thought the questions and discussion quite rich. 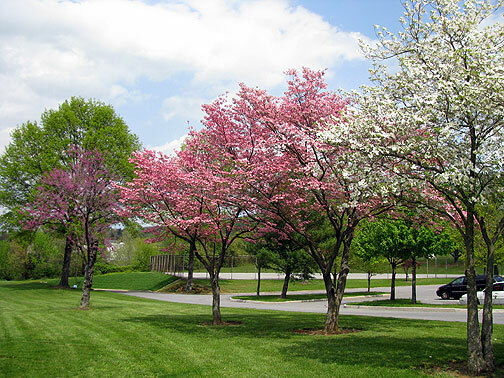 The Talk last night in Washington DC on Mayday was a bit disappointing… only about 13 people came and I didn’t feel the same kind of hopefulness and connection that I did after the Frederick evening. So it goes. Can’t hit well every night, and it was very kind of the folks at the Brian McKenzie Infoshop to host me at the last minute, after the Dead Poets and Busboy venue fell through due to weird misunderstanding… Tonight I’m off to Baltimore’s Red Emma bookshop and very much looking forward to meeting the folks there. The weekend I’ll be in Philadelphia, speaking at two locations, both during mid-afternoon Saturday and Sunday. Check info at Bindlestiff Books or Wooden Shoe if you’re in Philly… then it’s on to New York! I loved Cloudsplitter. Your tour sounds wonderful. Enjoy it.